Sorry, you have exceeded the number of allowed lookups. We allow a Maximum of 10 lookups within 48 hours, please try again later or call 01949 862 012 to register. You have reached the maximum number of appliances that can be registered simultaneously. Please complete registration below. The information you have provided on this form will be used to provide appliance guarantee services and our use of your personal information is described in our Privacy Notice. Amica appliance guarantee and registration is subject to these Terms and Conditions. 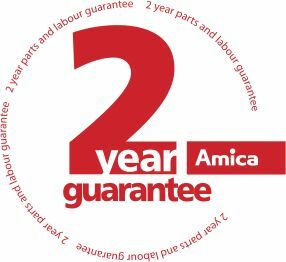 Thank you for purchasing your Amica appliance, all Amica home and kitchen appliances come with a two-year product parts and labour guarantee. Please fill in the form to register your warranty and, in the unlikely event that your fridge, freezer, oven, hob, washing machine or other Amica appliance should break down, we will have an engineer with you as quickly as possible. We use the information you have provided on this form to provide appliance guarantee services and will only use your personal information as described in our Privacy Notice.